It is with the greatest of regret that I have to announce to Rangers supporters that I have decided to step down as Chairman of Rangers Football Club. It is, I am convinced the correct thing to do under the circumstances. Unfortunately, recent events have led me to the conclusion that the only option left open is for me to submit my resignation and to leave the Board of Directors with immediate effect. Working with a Board which could rarely find consensus and agreement has created a highly-dysfunctional environment which has not been good for the Club. On top of that, there has been recent further disruption which again has rendered the Board less effective and efficient than it ought to have been. It is clear that Boardroom change is required and I would urge Rangers fans to get fully behind the resolutions which last week were presented to the Board and shareholders. Also, I would like to remind the Directors that when a General Meeting was requisitioned earlier in the year I, as Chairman, was urged by everyone on the Board to do everything in my power to avoid such a meeting. At that time, I worked very hard to achieve that and now I am urging the Directors to do exactly the same this time and if that means Boardroom changes then so be it. In fact I am now imploring everyone to back these proposed changes so that much-needed stability and a level of integrity can be restored to the Ibrox Boardroom. However, so far as the chief executive and manager are concerned, let me say this: Craig Mather, as I have said before is doing a good job. It is unfortunate that this has happened but when change does come I hope he’ll be allowed to continue the job he has started. As for Alistair McCoist, it is important that we all appreciate that no other Rangers manager has had to work with poorer or more trying circumstances. 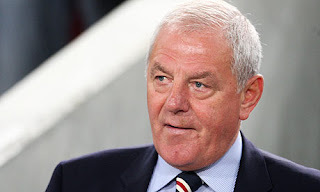 It is my fervent hope that when the dust settles and Rangers have a clearer path and future he is given the chance to manage under conditions similar to those which were afforded his predecessors. Last but most certainly not least, I must turn to Rangers supporters. They have suffered agonies and tortures over the last two years but they can be proud of their contribution. They did not waver in their support of their Club and as far as I am concerned they have been absolutely the one outstanding feature of this Club. Indeed, they are a reminder to those in the Boardroom that Directors have the massive and ultimate responsibility of serving, protecting and nourishing this Club for the benefit of the fans and not an individual or any associates. Rangers fans are a credit to their Club and they really do deserve so much better. As a manager I had to make many difficult decisions but none was tougher than the one I have just made. Stepping away from this Club is heart breaking but I will always be grateful for the support Rangers fans have given me down through the years. I will never forget and more than anything else I wish them the Club they truly deserve.